Michael Stebbins is a shareholder with Silicon Valley Law Group and the Chair of its Business and IP Litigation and Employment Groups. His practice focuses primarily on employment, intellectual property and commercial disputes. 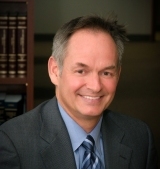 He has extensive litigation and trial experience in matters involving trade secret theft, employee solicitation, technology licensing, IP infringement, false advertising, earn-out issues, unfair competition, shareholder disputes, breach of fiduciary duty, trade libel, harassment, discrimination, wage and hour issues, and wrongful termination. He has also litigated complex matters involving real estate leases, construction contracts and insurance coverage. A significant portion of Michael’s practice also involves a full range of employment counseling services to management and executives, including the creation, review and revision of virtually all types of employment-related agreements and documentation, as well as investigations and advice regarding employee misconduct. Prior to Silicon Valley Law Group, Michael was a partner at Bergeson, LLP in San Jose, a partner with Tomlinson Zisko LLP in Palo Alto, and an associate with Skjerven, Morrill, MacPherson, Franklin & Friel LLP in San Jose. He serves as an Arbitrator and Settlement Judge with the Santa Clara County Superior Court, and is a member of the Santa Clara County Bar Association. C & D Consulting Engineers, Inc.
Los Gatos Orthopedic & Sports Therapy, Inc.
Silver Creek Fitness & Physical Therapy, Inc.
TCGIvega Information Technologies Pvt., Ltd. Defended hi-tech trade association in multi-day court trial over unpaid sales commissions. Judge rendered defense verdict from the bench following closing argument and awarded attorneys’ fees to client following post-trial motions. Lead counsel for defendant venture capitalist in seven-figure contract/alter ego claims arising from failed multi-location motorcycle business. Case ended when plaintiffs gave up on second day of trial after successful motions in limine and opening statements. Lead counsel for prominent security software company in contract and fraud action in federal court. Action concluded when Plaintiff abandoned remaining claims after client’s successful motions to transfer and dismiss. Represented multinational software consulting firm in bringing contract and fraud action against supplier. Case resulted in favorable settlement payment, ultimately satisfied through the forced sale of defendant CEO's multi-million dollar home. Defended local service company in unique name-based trademark infringement dispute. Won motion to dismiss without leave to amend, convinced court that matter was “exceptional” on motion for attorneys’ fees, and eventually recovered fees for client. Helped public semiconductor equipment maker obtain TRO, preliminary injunction and contempt sanctions for defendants' violation of injunction involving the theft of trade secrets and unfair competition. Case resolved with favorable settlement just prior to trial. Handled defense of earn-out claims against public firmware manufacturer brought by ex-division CTO whose company had been acquired. Matter resolved favorably after filing of successful TRO in federal court for CTO's improper retention of company IP. Investigated and prosecuted ex-corporate controller and related family members for fraud and embezzlement on behalf of civil engineering firm. Achieved consent judgment for high-six figures and prison term for ex-employee. Represented start-up in wage dispute with co-founder who contended he was merely an employee. Convinced Labor Commissioner otherwise and achieved defense award. Handled commission dispute for three high-tech sales executives against global telecommunications carrier. Each case resulted in six figure settlements and the ultimate modification of company’s commission policies and procedures. Prosecuted contract claims for jilted manufacturer's representative. Matter resolved for significant six-figure settlement on the eve of binding arbitration. Represented plaintiff in race discrimination jury trial against large aerospace company. Case resulted in six figure verdict for plaintiff. Handled defense of numerous race discrimination and sexual harassment actions in state and federal court brought by current and ex-employees of client which owned 50+ fast food restaurants. None of the cases resulted in verdicts against the client and achieved summary judgment in client's favor in several, including three cases where monetary sanctions were awarded against the unsuccessful plaintiffs or their counsel. Won TRO and preliminary injunction in trade secret/conversion action for hi-tech reseller against dumpster-diving ex-employee who had stolen proprietary customer information and started a competing business. Action resulted in permanent injunction, return of materials and agreement to repay all of client's attorneys' fees. Prosecuted trade secret action in state court for civil engineering firm against departed executive and new employer who had stolen ongoing projects and related proprietary materials. Action settled for the return of materials, repurchase of ex-employee's stock for nothing, and payment in full of client's attorneys' fees. Defense of six-figure wage and hour action brought against prominent verification software firm by systems analyst, claiming he was entitled to overtime because he had actually performed the duties of a systems administrator. Achieved favorable confidential settlement of nominal value the day before trial. Prosecuted sexual harassment matter arising from trade show incident on behalf of female VP of prominent hi-tech company against employer and individual executive. Engagement resulted in six-figure settlement for client without suit ever being filed. Renegotiated numerous employment agreements and equity-laden severance packages for executives of public and private companies, sometimes including negotiations resulting in the reclassification of termination from "for cause" to "without cause." Michael is a proud graduate and supporter of Bellarmine College Preparatory in San Jose. Michael has been a coach and sponsor in the Evergreen Little League and the Mt. Hamilton Youth Soccer League, and is an avid youth baseball, soccer and age-group swimming supporter. Michael has been active in the United States Tennis Association for several years, and serves as an NTRP 4.5 Captain.